Global Village "Our Belize Vacation" - "Our Belize Vacation"
Located 8-1/2 Miles on the Norther Highway in Ladyville, Belize - Central America. 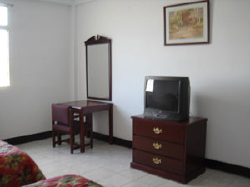 This Chinese owned hotel, quiet atmosphere, sparkling clean, with modern furniture and fixtures, and a good value for the money. Near the turnoff to the international airport, the hotel has free transportation to and from the airport and a fenced parking lot with 24-hour security. Great place to stay, if you're looking to be close to the airport either immediately after your arrival or just prior to your departure. 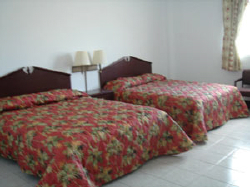 Spacious private rooms with a bath, shower, hot-cold water, queen size beds, television and cable channels, working desk.